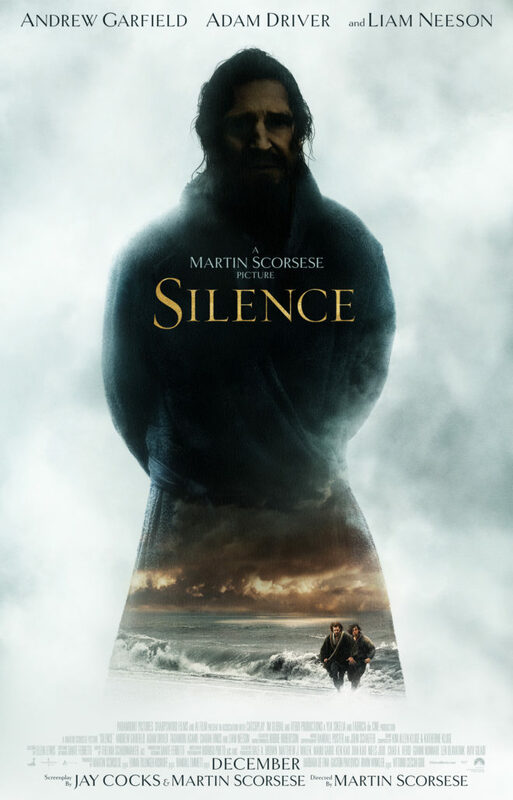 Silence, the powerful new film by iconic film director Martin Scorcese, is a complex story of faith and spiritual inspiration set during feudal Japan’s 17th century purge of Christians and their priests. It’s also a moving and thoughtful meditation on religious freedom, on personal versus state-sponsored faith, and on how character is defined by the choice of whether or not to submit to the State. The film is based on the 1966 novel of the same name by Shusaku Endo. In short, two priests, Fr. Sebastiao Rodrigues (Andrew Garfield) and Fr. Francisco Garupe (Adam Driver), travel to Japan to find their mentor, Fr. Ferreira (Liam Neeson). Reports from Portuguese traders say that Ferreira gave up the Catholic faith and now lives among the Japanese, choosing to preserve his own life rather than fight against a Shogun who has killed hundreds of thousands of Japanese Christians. The young Jesuits can’t believe someone with as deep a commitment to his Christian faith as Ferreira could turn away from the Church and God. So they set out to find the truth. Rodrigues and Garupe find themselves at the epicenter of the Shogun’s religious persecution: Nagasaki (at the southern most western tip of the main islands of Japan). The film places the events in and around 1640, which would be just after the Shimbara Rebellion (1637-38) and several decades after the beginning of the repressive period. In 1597, ten years after the ban of Christian missionaries, 26 Jesuit priests were crucified in an effort to purge Japan of missionaries and enforce a prohibition on its teachings. The rebellion forty years later consisted mostly of Christian peasants, fishermen, and ronin (masterless samurai) who rose up against the Shogun to protest higher taxes, their anger fueled by a persistent famine and ongoing religious persecution. The rebellion was suppressed by a coalition of Japanese lords under the shogunate, and 37,000 rebels and sympathizers were beheaded. Christianity survived only by going underground. The persecution of Christianity became even more focused and repressive in the rebellion’s aftermath, as the Shogun (who was situated in Tokyo in eastern Japan) viewed western religion as a threat to national unity. It’s in this period that Rodrigues and Garupe are led to a Japanese fishing village by Kichijiro (Yosuka Kubozuka), an alcoholic fisherman who has renounced his Christian faith. The villagers, however, are underground Christians (Hidden Christians) and excited to have the priests arrive so they can properly receive the sacraments. At the same time, the governor, the infamous persecutor Inoue Masashiga (Issey Ogata), relentlessly enforces the ban, requiring adherents to renounce their faith or suffer imprisonment, torture, and death. Rodrigues and Garupe administer the sacraments while at the same time searching for the whereabouts of their former teacher. They are eventually captured and imprisoned, and they are forced to watch believers systematically tortured and killed, some through crucifixion, others through drowning or beheading. None renounce their faith, impressing upon Rodrigues the purity and sincerity of their beliefs. As they bare witness to the torture, Rodrigues and Garupe are forced to question their own commitment to God and their faith. If they publicly renounce God, they can potentially save the lives of the remaining believers. The Masashiga and his lieutenant (Tadanobu Sano, 47 Ronin, Thor) insist that the only reason the villagers and peasants are dying is because of a stubborn and self-centered commitment to publicly proclaiming their fealty to God and Jesus Christ. Garupe is eventually martyred while trying to save believers who are being drowned, throwing Rodrigues into an emotional and philosophical tailspin and forcing him to seriously consider abandoning the Church and teaching Christianity. But have the priests truly renounced their faith? This is the film’s central question. A tenet of Christianity, artfully woven into the plot through the character of the lapsed Christian Kuchijiro, is that true commitment and fidelity are known only to God and in the individual’s heart. This principle is problematic under state and cultural oppression, because Christianity is also inherently a system of social practice and ethics—Christians are mandated to act toward others in a manner consistent with God’s will, as practiced on earth by Christ Jesus. Rodrigues must reconcile the mandate to act with love and forgiveness with the fact he endangers the lives of practicing Christians every time he publicly refuses to renounce his faith before Masashiga. But the story is more than a journey of personal faith. Silence also explores how the government uses faith to secure and consolidate power. Masashiga points out that he is not really asking Rodrigues to renounce his faith, only to stop practicing it and converting Japanese. He emphasizes the inner-directedness of Buddhism as a superior alternative to Christianity, and one consistent with the goals of the Shogun. (The film makes no mention of the indigenous Shinto religion and its practices, even though the rituals can be traced to the 8th century.) The State’s interest is national unity and subservience to the Shogun, not individual salvation or personal growth. Christianity undermines these goals because Christianity teaches that individuals have free will and are not creatures of the State, let alone the Shogun. Christians are taught that they are created by God, in the image of God, and loved unconditionally by God. Thus, God, not the State, has moral authority. Silence makes good use of this principle by telling a second, equally important story that involves whether the State or the individual will prevail when they are in direct conflict. Conventional wisdom would suggest that the State wins when priests and believers publicly renounce their faith in a Christian God. Scorcese doesn’t let the story end there, making the ending provocative and thought provoking. Silence has been mentioned as an Oscar contender for good reason. The story is complex but well told. Despite the 25 years Scorcese invested in bringing this film to theaters, the casting is spot-on, with excellent performances by Garfield, Driver, Ogata, Kubozuka, Asano, and others. Neeson does well, but his character seemed a bit flat, considering his role in turning Rodrigues and the drama that must have accompanied his character’s meeting with his former pupil. Despite being filmed in Taiwan, the rural, mountainous setting conveys the isolation and topographically challenging environment of western Japan. The film is long, over two and half hours, and the pace methodical, but moviegoers looking for deep content rather than flash should come away more than satisfied.